It goes without saying that some combinations are just unfathomable, among them a Rodham Clinton/Bush ticket in 2016, broccoli and whipped cream, and Kanye West and humility. On the other hand, hard as it is to imagine, some pairings just work, including oil and vinegar, chocolate and peanut butter and Sandra Bullock and Melissa McCarthy. Believe it or not, we can now add Norah Jones and Billie Joe Armstrong to the latter list. On FOREVERLY, a reimagining of the Everly Brothers’ 1958 release SONGS OUR DADDY TAUGHT US, this disparate pair not only come together, they totally pull it off. (Armstrong, in particular, shines, showing off a whole other side of himself). Mind you, this is no good-time collaboration….seeped in traditional country, folk and Appalachian roots music, these songs are full of death, loss, death, betrayal, death, regret, death, and….oh, yeah…death. But the pair nails it, never once coming across as posseurs or phonies. Things kick off on one of the few upbeat notes, with the rollicking “Roving Gambler.” Armstrong and Jones both shine vocally, blending together perfectly in a totally complementary manner. However, it’s the relaxed arrangement that’s the true star here, what with the subtle percussion, shimmering acoustic guitars and spirited harmonica. GREAT way to start things off! If you didn’t know better, you would swear “Long Time Gone” was a classic recording lifted right from the 50’s. One of the disc’s few love songs, it allows the dynamic duo to really play off of each other, with Armstrong all assured, yet vulnerable, and Jones almost coy and kittenish, yet strong and steely. THIS is what harmonizing is all about! Brilliant. You might think “Lightning Express” would be a rambunctious rockabilly rave-up, but you would be oh, SO, wrong….the first of those aforementioned odes to death and sorrow, it’s anything but! And y et, with it’s delicate vocals and subdued instrumentation, this sad story/song is a thing of beauty. You can just picture the pair singing this on a front porch as the sun sets and the fireflies start to dance around. Lovely. There’s a nice lilt to “Silver Haired Daddy Of Mine” that’s both enticing and confounding. Yes, you have more down beat lyrics about regret and atonement, but you also have an arrangement that lopes along at almost a cheerful pace. Anchored by the pair’s confident co-lead vocals, this is one of those things that shouldn’t work….but just does! “Down In The Willow Garden” is one of my favorite cuts off of FOREVERLY. A dark, gothic tale of greed, murder and paying for your sins, this haunted, haunting tune is just captivating. However, the stand out star here is Armstrong, who seems to be channeling his inner Don and Phil. Seriously….based on this performance, Billie Joe COULD be a long lost Everly! Wow! Things take a slight dip at this point. It’s not that “Who’s Gonna Shoe Your Pretty Little Feet” and “Oh So Many Years” are bad….it’s just that we’ve pretty much heard (or will hear) both tracks elsewhere on the disc, albeit to slightly stronger effect. That said, “Who’s Gonna Shoe…..” is a master class in harmonizing. Once again, Armstrong comes across as the long lost third Everly brother, while Jones brings a whole other perspective to the song with a feminine vibe. You would swear that these two have been singing together for years! There’s a nice country swing groove to “Oh So Many Years”, but this yearning love song seems out of place at this point (However, a full album’s worth of this style and sound down the line would definitely work!). “Barbara Allen” is my other favorite cut. Armstrong takes the lead lead on this hoe-down stomper about lost love, death and maybe even a curse or two. The arrangement is mesmerizing, full of fiddle, tamborine and twang, but it’s the lyrics that really get you: “They buried Willie in the old church yard/And Barbara in the new one/From Willie’s grave there grew a rose/From Barbara’s a green briar.” So sad….and so, so SWEET! The only problem with concept albums like this is that you have to take the good with the bad, and “Rockin’ Alone (In An Old Rockin’ Chair)” isn’t just bad, it’s AWFUL! Trite and chiched, this song has not aged well. Jones and Armstrong are in fine form vocally, but it just seems wasted on sappy lyrics that may have seemed sweet 55 years ago. The disc’s only real misfire. Jones takes the lead on “I’m Here To Get My Baby Out Of Jail”, and it’s a total winner. Jones has been dabbling in Country for a while now (her guest vocal on “If The Law Don’t Want You” from Rodney Crowell’s 2012 KIN album was especially rewarding! ), and the results show here…she wears the track like a fine silk shawl, wrapping herself around in it to pitch perfect perfection. Once again, VERY nice! There’s almost a tinge of flamenco to “Kentucky”, which brilliantly shakes things up. This longing ode to a deeply-missed home state chugs along, pulling at the heartstrings. Armstrong and Jones’ lead vocals are softly subdued, yet full-bodied. There’s a dreamy quality here, tempered by an undercurrent of whistfulness. Gorgeous….just gorgeous. Things wrap up with (what some are calling) “another one of those ‘dead baby’ songs.” Yes, the child at the center of the song is dying, and, yes, they even bring his/her last Christmas into the mix, but you can’t help but be in awe at how the pair makes it all so very touching, vs. maudlin and/or creepy. THAT’S singing at it’s most honest, universal and transcendetory. And it’s singing that leaves you wanting more! 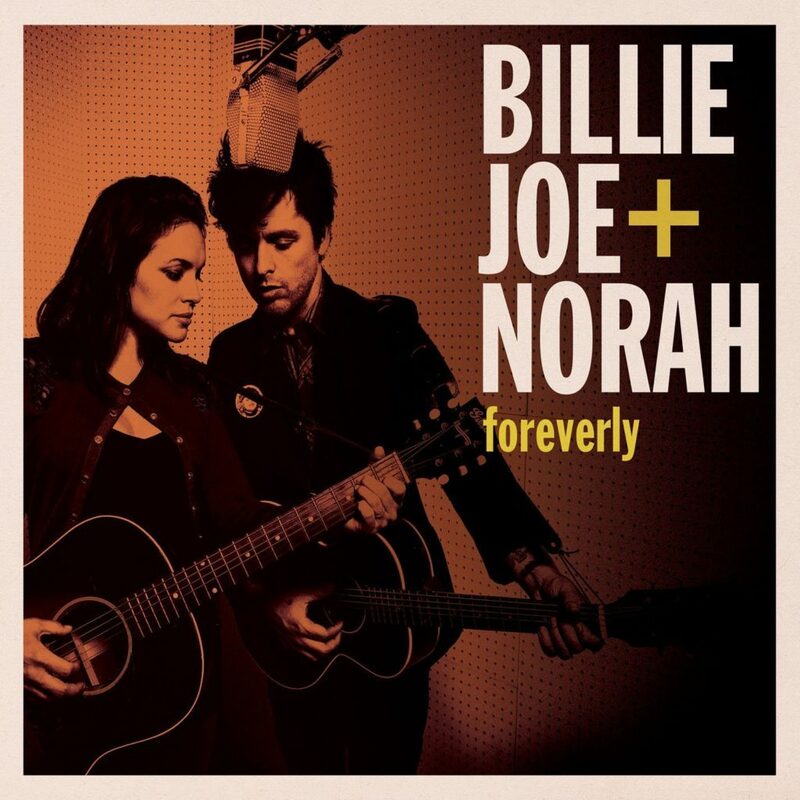 Here’s hoping that FOREVERLY is just the first of many collaborations between Norah Jones and Billie Joe Armstrong (personally, I’d like to see everything from Western Swing to 60’s rock! ), a pair that shouldn’t work, but, much like peanut butter and chocolate, is oh, so, sweet! (As with all my reviews, I’m docking the disc half a star for not including the lyrics).